We have room for twelve participants. If you are interested in participating, please let us know as soon as possible so that we can reserve a space for you. Each of us will pay our own expenses. The current estimated cost per participant is $3,500. The cost is based on departure from airports on the east coast. The estimated cost assumes air tickets would be purchased by March 2019. You would be expected to get inoculations depending on your individual needs. The price includes the following: round trip air travel to/from Nairobi; hostel lodging & food; internal transportation; bottled water; safari. Optional MedJetAssist insurance is available. 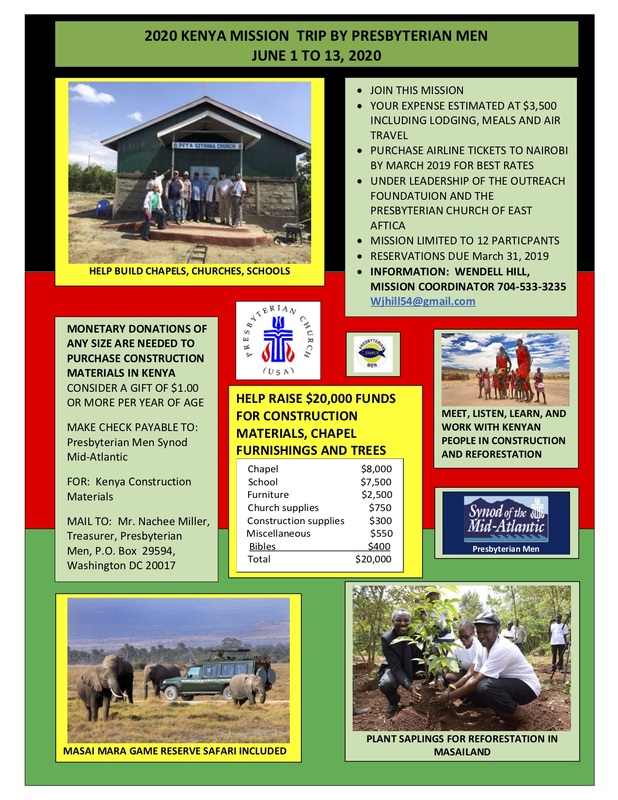 The Synod of the Mid-Atlantic Men’s Council has set a goal of raising $20,000 to cover the cost of building and furnishing a new chapel in Kenya. In addition, we will plant and commemorate trees throughout Kenya. Stu Ross is The Outreach Foundation Eastern African Consultant where he divides his time between Kikuyu Kenya, East Africa and San Antonio, TX. The Outreach Foundation is a mission outreach partner with the PCUSA www.theoutreachfoundtion.org and Stu Ross and his team will be our onsite advisors. He will handle all the daily logistics to assure our trip will be meaningful, spiritually enriching and successful. This mission trip will offer the participants an opportunity to meet, work with, and experience the people and culture of Kenya. We will end our trip with a safari to the Masai Mara game preserve.